Today's Letters: Dear Mr. Loerke, in honor of our upcoming Cirque do Solei show I give you full permission to start performing circus tricks in exchange for baked goods. Extra macaroons for you if you can figure out how to pull a rabbit out of a hat. Dear Warrior Dash, Tim and I have participated in several adventure races before, but we think yours is by far the most FUN. Can't wait to get dirty again this year. Dear Michael Murphy House Tour, everything about your 650 sq feet loft makes me junk drunk. Four points for your repurposed street finds, three points for being the first man I've ever envied for his jadeite collection. Dear Husband (who always gets two letters), you are the honey of my tea, the type of my writer, and the milk of my mustache. Love you more than flea market finds and tightrope walkers. 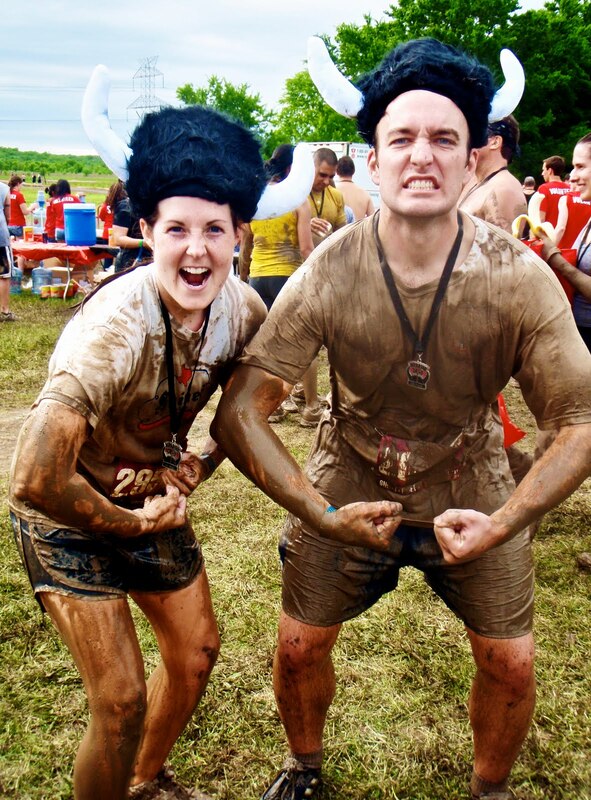 BTW, let us know if you'll be joining us in the North Texas Warrior Dash on Saturday, April 16th. We'll be running in the 10:30am heat with some of our closest Homies! You can view photos of last year's race HERE. PS, Mr. Loerke and I will be speaking at Re|Engage on Wednesday, January 26th at 6:30pm. We'd love to have you join us as we share more about our story and journey through marriage. You can go HERE for more details. tea towels and glass topped canning jars (which I actually use to can stuff in). Both excellent excuses to go to flea markets and yard sales. Whew...we collect vintage paint-by-numbers, old alarm clocks (the kind with the bells on top), vintage thermoses, owls, globes, old cameras...i am sure there is more. I love vintage salt and pepper shakers! Any ones that are unique glass, I love. BTW- went to the OVO cirque du soleil in Atlanta last week and absolutely loved it! I hope that y'all enjoy! I wont be joining you in the warrior dash, but I will be joining you at Ovo! We are going on Feb 20th. I am so excited. I visit as many Cirque shows as I possibly can. Oh and I collect Christmas ornaments. Mostly from my travels. I have to have 2 trees at Christmas now. vintage salt and peppa shakers! I did warrior dash in your neck of the woods last year. An awesome time! I collect glass jars... Mason jars, wine bottles, old ovaltine jars, cups, old soda bottles, vases... Anything glass and beautiful and I'm in love! Apparently, I am collecting ramekins. I didn't realize it until one day I noticed I have 30-40 ramekins in lots of different styles. That's a lot of creme brûlée. You. Better. Stop. I'm finally commenting because this is too much. Warrior Dash AND Cirque du Soleil??? Muddy Buddy (which is similar) and CdS are two of the greatest things I have ever been a part of! That seals it - we are definitely mfeo. Five years ago, I took my husband to Cirque for his birthday. Afterwards, in an effort to imitate some moves we'd seen, he was swinging from the (low) rafters and his wedding ring got caught on a nail. He was stuck for a second and was left with a sore finger. Later I asked, "What did you learn?" to which he replied, "not to get married." We're still married, but he rarely wears his 1906 ring for "safety" reasons. I am so signing my hubs and I up for the warrior dash here in Oregon. Looks like a blast!! What is the distance of the race? Hubbo & I saw OVO while they were in Boston. Awesome show & the finale rocks! Enjoy! Em - the Warrior Dash looks amazing! Do you have a guess at how far the run is? Todd's not a runner, but I bet he could do it. michelle, i'd like to start doing my canning this year with those. for now i use the new ball jars. will add those to my list of flea market finds! amanda, we collect have of the same things you do! love it. kt, so fun! the previous for it on youtube looked amazing. we were able to score tickets 70% off via groupon so were blessed to be able to go! kim, you'll have to let tim and i know how it goes! we haven't been to frisco in awhile. perhaps we will make a trip to ikea while we're there just so husband can push the cart. (they're his favorite). gracie, milk glass and jadeite makes me weak in the knees so i totally understand your glass jar addiction. grace, husband often finds old postcards and writes me letters on them. i love the old handwriting and postage! anony, i can't tell if this comment was from my dad or not. he collects hall ramekins like none other! littlejohn, we've done muddy buddy austin & dallas before! it's official! we. are. friends. ps, tim's also participated in the ft worth mud run and has had a longtime dream to do the tough guy challenge in europe. MUDDY HUSBAND. chels, thanks! so glad you like it ... my web designer is brilliant. carroke, sounds like your beloved is lucky to have his finger! glad you guys liked Cirque. we're so excited! mindy & merritt, it's roughly 3.2 miles ... if you can walk / run a 5K you'll be fine! the course is honestly so muddy you end up having to walk most of it. one thing i know for sure, you won't regret doing it! becka, it will be our first cirque show. my brother's been trying to convince us to go for quite some time ... luckly we were able to get cheap tickets via groupon. yessssssssss.